"The bracelet monitors the heartbeat. 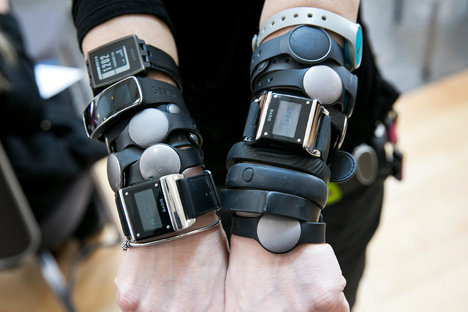 It is fixed to the human body and monitors numerous parameters." The first batch of special Cardiomarker devices which control heartbeat and assess the general state of health will be soon tested by the Military Medical Academy, adviser of the first deputy director general of the Radio-electronic Technologies Company Vladimir Mikheyev told Echo of Moscow radio station. "The device has already been tested by the center of aviation and space medicine. The first batch has been produced and is undergoing test trials. In a month the first industrial batch which will be supplied both to troops and medical establishments in several Russian regions will be tested by the Military Medical Academy and scientific and medical army companies," he said. Mikheyev said the device was designed for fighter pilots to control their heartbeat during aerobatic flights. "The bracelet monitors the heartbeat. It is fixed to the human body and monitors numerous parameters. The state of a person is determined by the cardiac muscle operation," he said. The cost of the bracelet is estimated by the producer at 8,000-10,000 rubles ($125-$157), Mikheyev said.